Halloween is over, and the only zombies we saw were on a t-shirt! Did you know the Nintendo Wii has had five Resident Evil games released on it? One, two, three, four, and five! Resident Evil: The Umbrella Chronicles released on November 13, 2007 for the Nintendo Wii with a MSRP of $49.95. The game was published by Capcom, and it received an ESRB rating of "MATURE" with "Blood and Gore, Violence" listed as content for gamers and parents to be aware of. How many hours can you expect from Resident Evil: The Umbrella Chronicles if you have never played it? How many U.S. Wii owners have reported playing it, and how many hours have they reported playing the game since it released? You may be feeling like a zombie from all the Halloween candy, so make sure to brew yourself some coffee and let's take a look! Data for U.S. Wii owners that have used the Nintendo Channel. 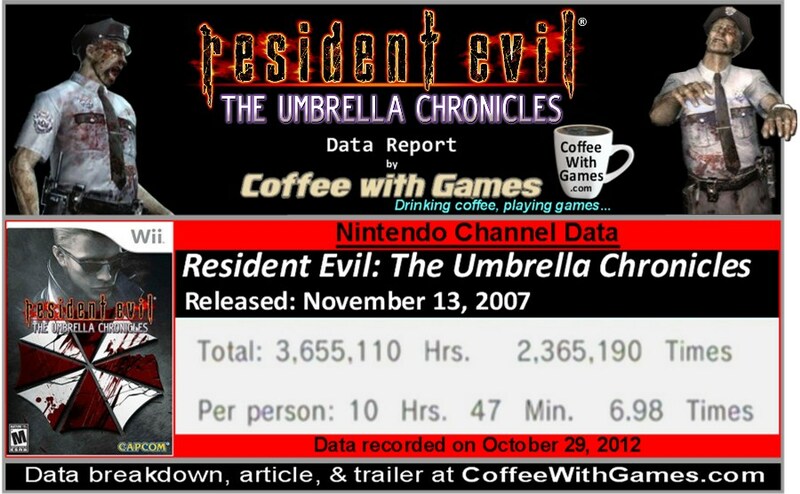 Resident Evil: The Umbrella Chronicles has approximately 338,852 Wii owners from the U.S. that have reported gameplay data, with 1,812 days possibly reported. The average play-time reported is 10 Hours 47 Minutes "Per person" as the image shows, which averages to be about 1 Hour 32 Minutes played per time/day. 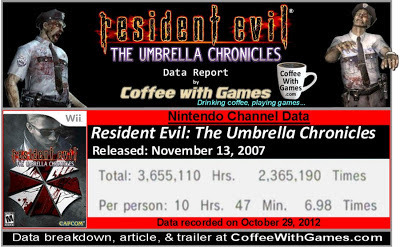 Based on the Resident Evil Wii games with data reported through the Nintendo Channel, Resident Evil: The Umbrella Chronicles is the most played Resident Evil Wii game according to its 3,655,110 Total Hours reported. How did critics and gamers review the game? The game has a "professional" critic review score average of 75.12%, based on 55 reviews on GameRankings.com. It has a customer review score average of 67.81%, based on 151 reviews from Amazon.com. Critics seemed to enjoy the game and were able to get by issues in the game, while some customers have been strongly opinionated about why the game is tough to recommend and seemingly broken according to some. I have not played any of the Wii's Resident Evil rail shooting games such as The Umbrella Chronicles, but I did own and beat Resident Evil 4 on the Wii. If you are not familiar with the storyline and gameplay of The Umbrella Chronicles, the video below will give you a good idea of what you can expect. I don't think seeing Resident Evil: The Umbrella Chronicles as the Wii's most played Resident Evil game according to "Total Hours", is really surprising. It was the Wii's first original, non-port, Resident Evil game and it was only followed up by just one other original Resident Evil Wii game; Resident Evil: The Darkside Chronicles, which was also a rail shooter. The other three Resident Evil games were all ports of older Resident Evil games. One thing I am wondering about is Resident Evil on the Wii U. Capcom is currently listed to only have one Wii U title in development and scheduled for release in the system's launch window, and that game is Monster Hunter 3 Ultimate. I'm wondering if Capcom will take a different approach with the Wii U system, like the Wii Resident Evil rail shooters, and create new Resident Evil games for it; or, will they start off by porting over perhaps Resident Evil 5 and the newly released Resident Evil 6, both of which were not released for the Wii? If you played Resident Evil: The Umbrella Chronicles would you recommend it to other Wii owners? Also, is Halloween candy laced with the t-Virus making people zombies? Perhaps, and I think on November 6th, it could be made very clear.